Your one-stop guide to becoming a product management prodigy Product management plays a pivotal role in organizations. In fact, it's now considered the fourth most important title in corporate America yet only a tiny fraction of product managers have been trained for this vital position. Play the piano today with an easy-to-use instruction set! Piano For Dummies, 3rd Edition is an invaluable resource for anyone seeking fundamental piano instruction. Shape the leadership of tomorrow Business Coaching & Mentoring For Dummies provides business owners and managers with the insight they need to successfully develop the next generation of leaders. The core concepts you need to ace Anatomy Perfect for those just starting out or returning to Anatomy after some time away, Anatomy Essentials For Dummies focuses on core concepts taught and tested on! in a typical Anatomy course. Your plain-English guide to currency trading Currency Trading For Dummies is a hands-on, user-friendly guide that explains how the foreign exchange ForEx market works and how you can become a part of it. Currency trading has many benefits, but it also has fast-changing financial-trading avenues. Try a hand at bridge-and outsmart your opponents Bridge is the most popular card game in the world-and, as any player will tell you, is simply the best card game ever. The easy way to boost employee engagement Today more than ever, companies and leaders need a road map to help them boost employee engagement levels. Count your carbs and count on managing your diabetes Living with diabetes doesn't have to mean giving up all of your favorite foods. Carbs from healthy foods boost nutrition and supply essential fuel for your brain and body. Serious about jamming, understanding, and creating guitar-driven music? Easy. With an approachable and engaging style, Guitar Theory For Dummies goes beyond guitar basics, presenting the guidance intermediate to advanced players need to improve their improvisational and compositional skills. Lower your blood pressure in just two weeks with the #1 rated diet When high blood pressure becomes chronic, it's called hypertension a condition that affects 970 million people worldwide, and is classified by the World Health Organization as a leading cause of premature death. Start your music career off right with this fun guide to the music industry Music Business For Dummies explains the ins and outs of the music industry for artists and business people just starting out. 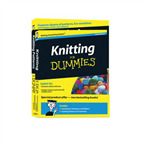 Two books which demonstrate how to improve your knitting skills. Hundreds of useful phrases at your fingertips Speak German - instantly! Traveling to Germany but don't know German? Taking German at school but need to kick up your conversation skills? Don't worry! This handy little phrasebook will have you speaking German in no time.